It’s the early hours of May 26, 2012 and when the sun rises across Cardiff Bay there’s already a huge crowd gathered to greet the morning and Matt Smith. 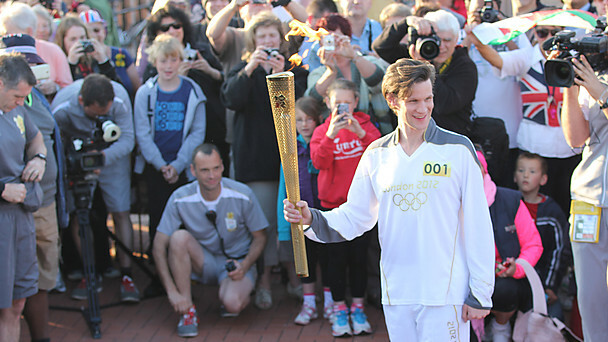 Because today, Matt Smith has the honour of being the lead runner in the Olympic Torch relay, carrying the world’s most famous Flame for part of its journey from the Temple of Hera to London. Matt’s used to early starts and is in high spirits when he arrives at the Norwegian Church Arts Centre. His mood is further bolstered by the masses of people who have come along to enjoy the occasion and lend their support. It’s great to see so many well-wishers and the whole team is very grateful to everyone who has managed to make it to the event. As he walks towards the Church which will be the mini-base for the morning, he greets the crowds. ‘What are you doing up so early?’ he jokes. First things first! Matt meets the press and enthuses about the Torch Relay. He also finds time to talk to us. So, how’s he feeling? 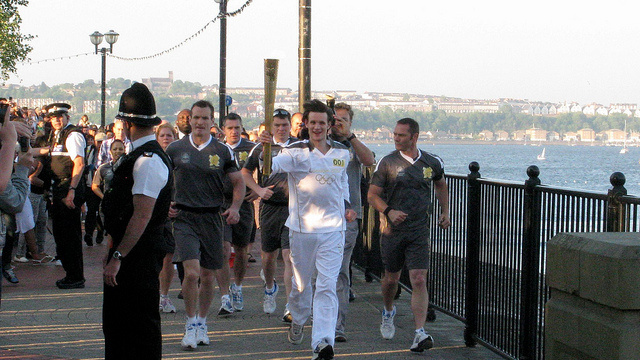 Matt clearly can’t wait to get going and his time with the Torch quickly arrives. He begins his run at 6.29am in sight of BBC Wales’ Roath Lock studios where Doctor Who is filmed. (‘It’s nice to be doing it in the Bay,’ he comments). The atmosphere is as sunny as the weather, but there’s also an awareness that this is part of a historic tradition. Matt takes the Torch with pride, running to the Senedd whilst being cheered on by the frankly fantastic crowd. The Flame is then passed to the next runner – eventually it will reach the Olympic Stadium where it will light a cauldron symbolising the start of the Games. But for today, Matt’s job is done and he has played his part. Exactly five years ago today an episode called Human Nature saw the Doctor, in the guise of John Smith, comment that ‘Mankind doesn’t need warfare and bloodshed to prove itself.’ In fact for almost fifty years Doctor Who has depicted a Time Lord from the planet Gallifrey uncovering and celebrating humanity’s very best traits. Endeavour, co-operation and a sense of striving towards better ways. Carrying a torch into the darkness. And this morning the message of the show and the reality merged into one as Matt Smith – our brilliant Doctor – held the Olympic Flame aloft and cheered on by an amazing crowd, blazed a trail towards the Games that epitomise those qualities. For a few minutes in the Cardiff sunshine, the hope of the Olympic Games and the spirit of Doctor Who seemed to burn strong and bright. Moving. Magical. Indomitable!